The University of Arkansas Libraries are honored to commemorate the life and legacy of Mrs. Betty Flanagan Bumpers. The activist and civic leader, former first lady of Arkansas, and wife of Governor and U.S. Senator Dale Bumpers passed away November 23, 2018. 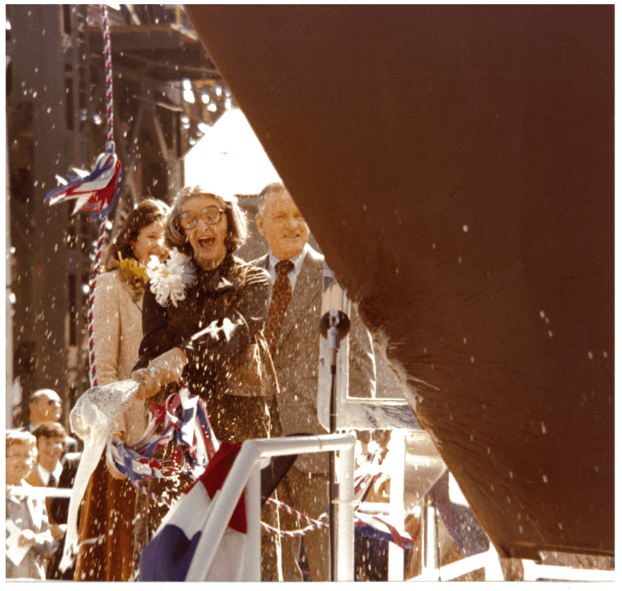 The Libraries’ Special Collections holds numerous archives documenting the profound impact Mrs. Bumpers had on her state, her nation, and the entire world. 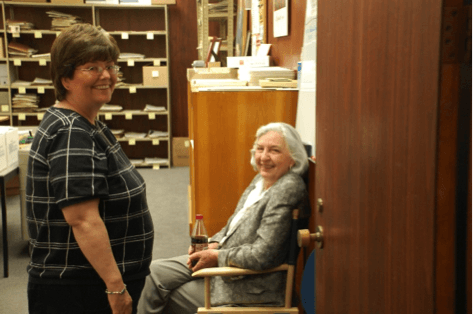 Betty Bumpers visiting Special Collections in 2010. Betty Flanagan was born in Grand Prairie, Arkansas in 1925. Her father Herman “Babe” Flanagan was a farmer and auctioneer, and her mother Ola Callan Flanagan was a homemaker. Betty attended the Iowa State University and the Art Academy of Chicago, before finishing at the University of Arkansas. She and Dale Bumpers first began dating in high school, and after Dale competed his service in the Marine Corps, he and Betty married in 1949 and settled in Chicago as Dale attended the Northwestern Law School. She had begun teaching elementary school during World War II and continued to work professionally as a teacher as Dale began his law practice in Charleston, Arkansas and struggled to operate his family’s hardware store. They had three children–Brent, Bill, and Brooke. Betty Bumpers became a tireless advocate for Arkansas women and children as her husband’s political career advanced. As first lady she launched the “Every Child by ‘74” campaign, a statewide immunization program that brought together the Arkansas League for Nursing, the State Health Department, the Arkansas National Guard, the State Nurses Association, the State Medical Society, the Cooperative Extension Service of the University of Arkansas, the Education Department, religious groups, and other volunteers. Dale was elected to the U.S. Senate in 1974, and Betty extended her coalition building to include other congressional wives in Washington, DC, as well as Mrs. Rosalyn Carter after Jimmy Carter became President in 1977. 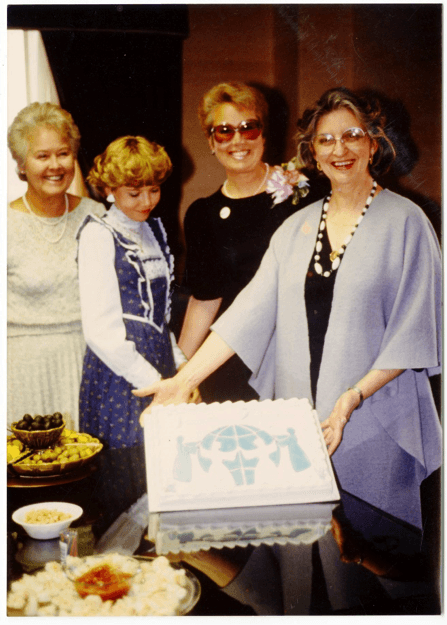 The immunization project became a model for similar initiatives across the United States, and Bumpers and Rosalyn Carter established “Every Child By Two” in 1991 to extend the reach of the work even further. The National League for Nursing, the American Academy of Pediatrics, and the U.S. Department of Health and Human Services recognition were just some of the groups that honored Mrs. Bumpers for her dedication and leadership. The Immunization Project’s papers are available for researchers in Special Collections. After realizing the influence that the fear of a nuclear catastrophe was having in her own daughter’s life, Betty Bumpers and other women in Little Rock founded Peace Links in in 1982. The group’s aim was to engage women and other less represented groups around the world in the mutual goal of eliminating the threat of nuclear war. Special Collections has served as the repository for Peace Links’ archives since 1989 and incorporated the records of regional chapters, as well. 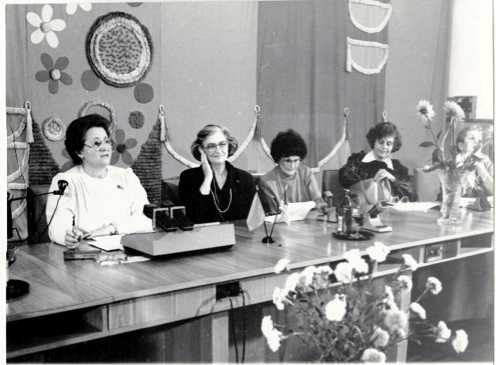 By building networks and dialogue outside of the normal channels of international diplomacy, Peace Links sought to educate and create awareness of alternatives to nuclear war through specific projects, such as the U.S./Soviet Women’s Exchange. Eschewing political affiliations, Peace Links used other organizations—often those associated with the “woman’s sphere” such as churches and garden clubs—along worth professional associations to promote peace as a viable alternative for national and international policy development. As the Soviet Union collapsed in the early 1990s, Peace Links coordinated continued assistance for victims of the Chernobyl nuclear catastrophe. With the end of the Cold War and normalization of relations between Russia and the United States, Peace Links wound its efforts down, and they closed the Washington, DC national headquarters in 2000. Betty Bumpers was inducted in the National Women’s Hall of Fame in 2005 for her tireless efforts to combat childhood disease and to promote world peace.